So I went to Fandom Fest, and ate the very best kielbasa I ever had in my life. How good was it? It was genius! Genius In A Box, to be exact. Genius In A Box is one of Louisville’s fabulous food trucks. This year, the Fandom Fest organizers arranged for a half-dozen or so food trucks to park outside the convention center and it was my luck to choose to try the Binet at Genius In A Box. The Einstein was tempting, as was the Tesla (a vegetarian burger). I heard great word-of-mouth about both those, but the Binet was a kielbasa, and I’m a sucker for those. I wasn’t disappointed. It was so good, every bite I took made me think, “I’m so glad I chose this!” Day 2 of the convention — I went back and got anudder one. The kielbasa was juicy and flavorful, with no ghastly bits in. It was topped with grilled peppers and sauerkraut (I asked them to hold the onion, since I was selling books, right?). It was served on a potato bun that was soft and fresh and held up to the filling, so I didn’t end up holding naked filling with crumbs on. I would give this truck two thumbs up, but I need my thumbs to hold my sammich. A WRITING PROMPT FOR YOU: A character stands in line at a food truck. What happens? This entry was posted in Food. 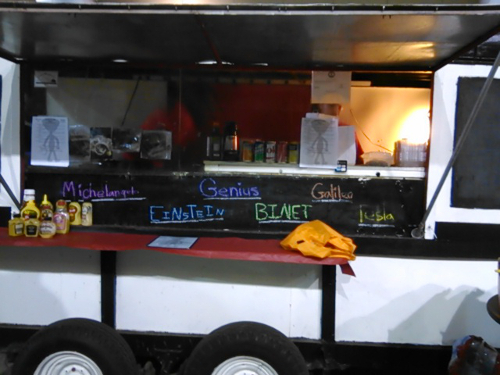 Tagged food, food trucks, Louisville food scene. Please, Marian, sorry to show my ignorance, but what is a kielbasa? It sounds as though it was delicious, but what goes into it, please? There you are, making me hungry again! Oh, I’m tellin’ you WHAT. It was SO GOOD.